Beet is my other favourite root vegetable, and you know I love root veggies as much for the taste as for their healthy value. 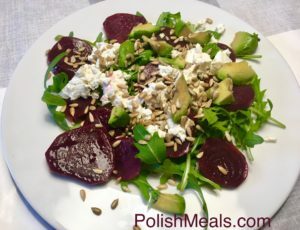 Beetroot can improve athletic performance, lower blood pressure, but in my case I want to increase my blood flow, build red blood cells and get some iron and other minerals. 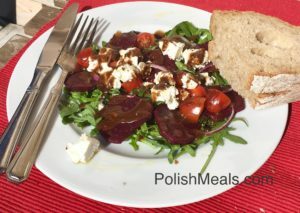 Beets are not that popular maybe because they have a ‘hidden’ taste but with the right ‘company’ such as spices, marinade, dressing – they make very very tasty meals. 1. Bake beets (not peeled) in a caserole dish for 60 minutes at 180 C (350F). Cool them and peel, then cut in 0.5cm slices. Ulternatively, you can steem them, peeled and sliced for 60 minutes. Cool them.